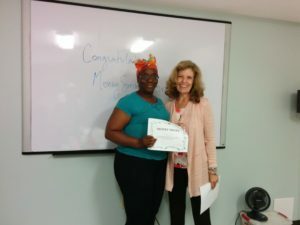 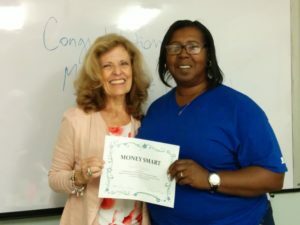 As part of Calvary’s life skills education program, members of the Women in Housing and Finance Foundation have been leading a personal finance course for women at Calvary since 2013. 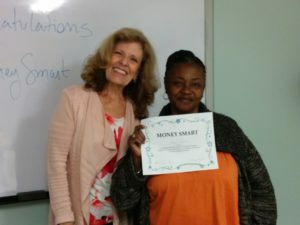 The course, FDIC’s Money Smart, has always been a favorite among women at Calvary, because it addresses real life financial issues. 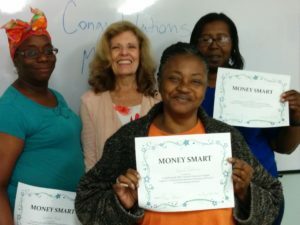 Over the past three years, volunteers from Women in Housing and Finance have taught 9 sessions of Money Smart, and have educated nearly 90 women at Calvary on topics like addressing credit issues, budgeting, and learning to save by “paying yourself first”. We want to extend a huge thank you to the Women in Housing and Finance Foundation for their dedication to leading Money Smart for women at Calvary, and for their commitment to empowering women as they build stronger, more financially secure futures for themselves.